Bali is beautiful, so beautiful that makes a lazy person like me had to immediately write a post about this memorable trip after went home. Bali is one of most famous destination in Southeast Asia you must have a visit. That is the first reason. 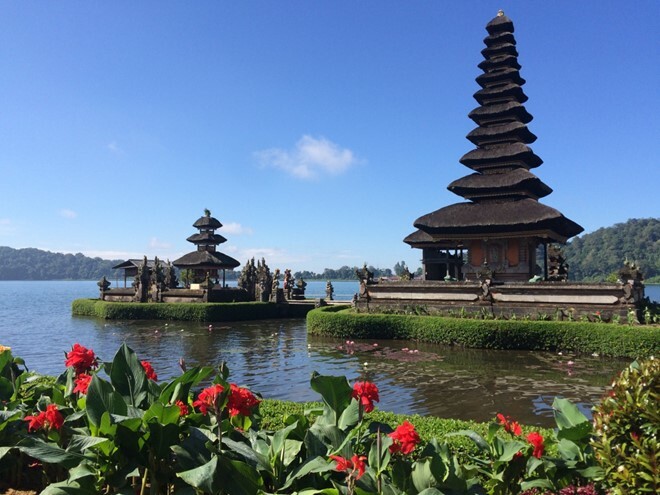 The second, Bali completely meets the criteria of my tour: nature, culture, sea, and shopping. Bali has mountains, forests, lakes, and terraces. Cultural imprint is reflected in every aspect. Almost anywhere I went, I also caught a part of culture, from the temples, the houses to the people’s costumes. Bali has many beaches. I do not know how to swim but still love the ocean. Just sitting on the beach watching the sea, listening to the waves is also happy enough. In Bali, there are many secret and private beaches and fine sand beaches located between the cliffs. Although not as much as at the big cities, Bali still have some shopping areas (mostly in Kuta) are also quite good. The third is the cost of the trip in Bali generally in my ability to pay, not be overpriced like other countries. I know plenty of people who traveled Bali, so it is quite easy for me to inquire them about their experiences. The last reason I chose to go to Bali is that I have seen the movie Love Story in Bali and read the book “Eat, pray, love”. Just like that, I have “crushed” Bali even before setting foot there. Should check in online in advance to save time, no need to deposit luggage (or do it for those who are lazy to drag the suitcases). You should carry some candy to prevent the hunger during the flight. Booking hotels: In Bali has several main areas such as Kuta, Ubud, Seminyak, Nusa Dua. Kuta is where concentrates a lot of tourists, especially the backpackers, very crowded and bustling. We like these crowded places such as Kuta. Ubud is the heart of Bali, the cradle of traditional culture. If you want to be close to the nature, close to the natives and enjoy the cool fresh air of nature, then Ubud is the perfect place for you. Seminyak now is as famous as Kuta. In this area, you should travel in a group so that you can rent a villa, the cost is quite cheap even when splitting out. Nusa Dua area has many luxurious resorts. In Kuta, we booked a 2-star hotel, though a bit small but still has a pool. Generally, the interior was modern, suit with my preference. The quality of the room was a bit disappointed (a dark room and a bit old), but it was not bad at all. 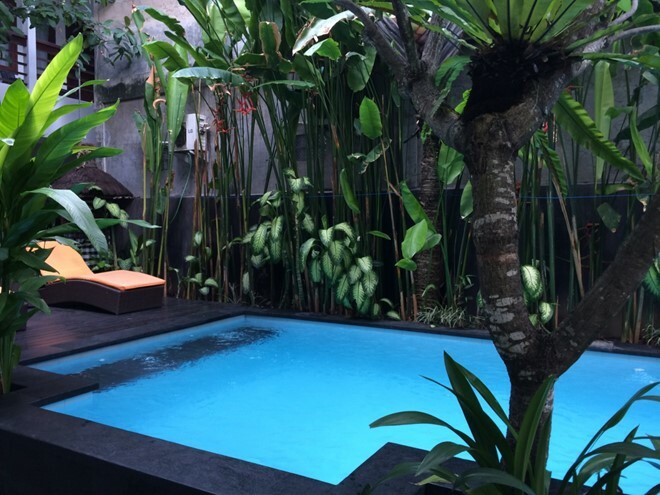 Located in a beautiful location in an alley near the most crowded and busiest street in Kuta, so even though in the center, the hotel is pretty quiet. 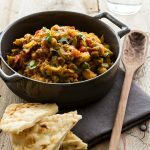 The hotel location is situated next to the local market; at the head of the lane has a supermarket (which is opened 24 hours a day) and restaurants, so it is very convenient. Hotel staffs were very attentive and enthusiastic (I appreciate this point). I booked a deluxe room on the 1st floor which has such a beautiful view but not privacy, because some guests just walked around sometimes. Service: In Bali, there is a pretty good form of tourism is the private car rental, with a driver knows English. I think the prices are not too high. You can follow your schedule or the driver will suggest. Along the way, if you want to stop somewhere then you can ask the driver. We went with a 4-seater car, with cool air conditioning. This form is almost a kind of official service in Bali. The driver can take you to visit the sights without having to buy ticket, and can take a picture for you. The driver is a super nice photographer, more than us at least J. Day 1: Fly and fly. Arrive in the late evening, go to Kuta hotel for the check-in procedure and rest. 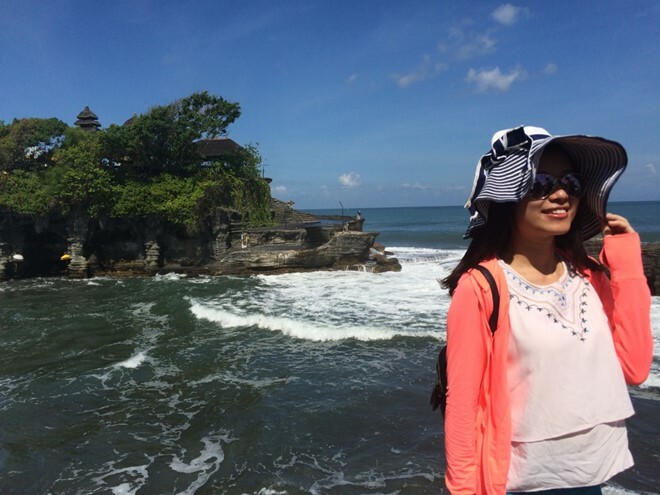 Day 2: 9h: Come to visit Tanah Lot Temple. 13h: have lunch at Pirates Bay in Nusa Dua area then go to the beach. 16h: come to visit Uluwatu Temple and watch the Kecak Dance (the show from 18 – 19h30). Have dinner at Jimbaran beach and then come back to the hotel. Day 3: 7h30: come to visit Ulun Danu Beratan Temple. Stop on the way for drinking strawberry juice. Visiting the Monkey Forest Ubud. Have lunch at the restaurant next to the entrance. Visit Tegalalang rice terraces. Visit Ubud art market to buy souvenirs. Come back to the hotel for clean bathing then walking around Kuta, having dinner and going to the bar or the coffee shop. Day 4: Get up early to go to the beach in the morning. Have breakfast. Rent a motorbike at the hotel and go shopping around Kuta areas such as Kuta Beach Walk, Mal Bali Galeria. Have lunch. Swim in the hotel pool in the afternoon, have dinner, rest, and go to the airport. Day 5: 9h: Come back to Hanoi. Prepare for the next working day.